What is a vulnerability worth? If you are an attacker looking to launch an attack on an unsuspecting organization, your answer will be very different than the IT administrator running the organization. HP DVLabs runs the Zero Day Initiative, the industry’s leading organization for purchasing and disclosing vulnerabilities. In this unique position the DVLabs team must be keenly aware of both the black market for selling vulnerabilities and exploit information, as well as the potential costs to the enterprise affected by such vulnerabilities. 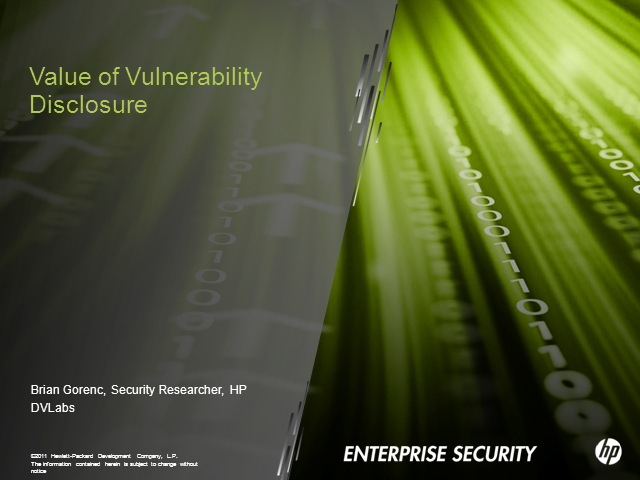 Join Derek Brown, security research with HP DVLabs and liaison for the Zero Day Initiative for session on vulnerability disclosure and why it is so important to the security industry.